Advanced Foot Energizer® » How Does Muscle Stimulation Work? Or maybe you can’t because of the daily reality of pain-ridden feet. Imagine returning home from a full day of work and eagerly accepting an invitation to go out. Or maybe you can’t because you know you will decline…again. Your feet are too sore. Too tired. Too achy. Your medication provides only temporary relief and you know it can be harmful to your long-term health. Great news! You don’t need to imagine anything again: real, long-term pain relief is possible and the relief does NOT include medications. 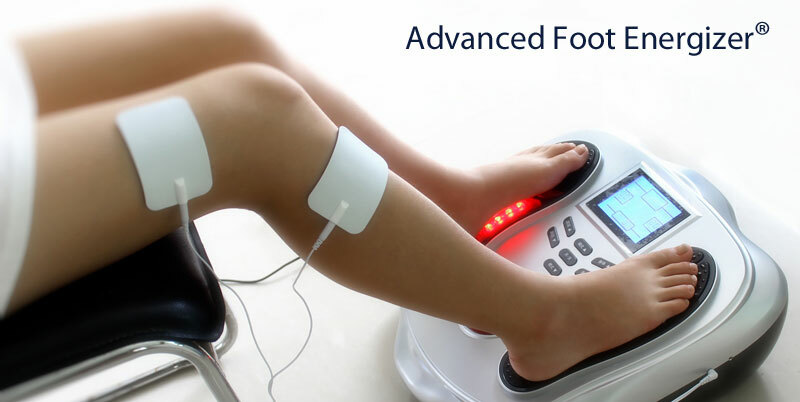 The Advanced Foot Energizer uses powerful prescription-strength neuromuscular electrical muscle stimulation (EMS) that literally blocks pain signals to your brain while conditioning and rejuvenating your muscles. With repeated use, your sore, tired, and achy feet will transform into happy, active, and satisfied feet. Now can you imagine a day when your feet don’t hurt? Powered muscle stimulation (also known as neuromuscular electrical stimulation) works by activating the nerves and muscles in your body, improving muscle function. The stimulation increases the flow of blood helping reduce pain in your feet and invigorating your tired legs. By using a combination of modes that include EMS (Electrical Muscle Stimulation) and TENS (Transcutaneous Electrical Nerve Stimulation), the Advanced Foot Energizer is able to send micro-current pulses through the soles of your feet. The Advanced Foot Energizer offers 25 different programmed modes. Modes 1 through 8 are programmed for Powered Electrical Muscle Stimulation (PMS or EMS). Modes 9 through 25 are programmed for Transcutaneous Electrical Nerve Stimulation (TENS). EMS modes stimulate healthy muscles in order to improve and facilitate muscle performance by applying electrical muscle stimulation to the soles of your feet through two large foot-shaped pads. Your foot and calf muscles will contract and relax repeatedly which helps pump blood through your legs. TENS modes are used for temporary relief of pain associated with sore and aching muscles in the shoulder, waist, back, back of the neck, arms, legs and feet due to strain from exercise or normal household activities. Modes 9 through 25 effectively block pain by applying electrical current to stimulate nerves. Learn more about TENS from this Introduction to Transcutaneous Electrical Nerve Stimulation from UCLA. The prescription-strength Advanced Foot Energizer provides foot and leg stimulation through large foot-shaped pads and body stimulation through reusable body pads; both forms of stimulation are controlled by a remote control or by the controls directly on the Advanced Foot Energizer. You choose between 25 programmed therapy modes and 99 intensity levels independently for feet and body treatments. These treatments can even take place simultaneously! A User’s Manual, included in the purchase of the Advanced Foot Energizer, answers any questions you may have about using the device. 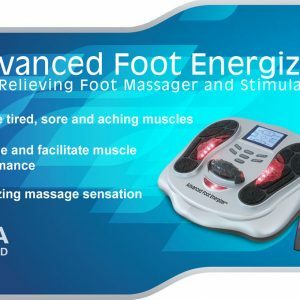 When sold as an over-the-counter powered muscle stimulator in the United States, the Advanced Foot Energizer is not intended to be used for therapy or treatment of medical diseases or medical conditions. The Advanced Foot Energizer is intended for muscle conditioning by stimulating muscle in order to improve or facilitate muscle performance. The Advanced Foot Energizer is also to be used for temporary relief of pain associated with sore and aching muscles in the shoulder, waist, back, neck, arms, feet, and legs due to strain from exercise and normal household and work activities.